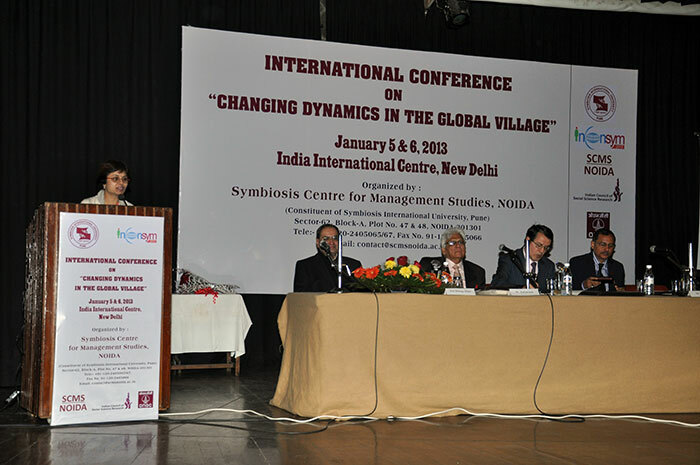 The first International Conference on "Changing Dynamics in the Global Village", INCONSYM 2013 was held on the 5th and 6th of January 2013 at Indian International Centre, New Delhi. The conference was presided over by Ambassador Mr. Prakash Shah, Chairman, Planning and Development Board, Symbiosis and on this occasion Dr. Vidya Yeravdekar, Principal Director, Symbiosis and Acting Vice Chancellor, Symbiosis International University delivered a special address with a focus on SIU initiatives in response to a fast globalizing world. The Guest of Honour, CS Mr. Nesar Ahmed, President, The Company Secretaries of India, ICSI then elucidated on what the professional institutes need in order to keep pace with the changing dynamics. Finally the Chief Guest H.E. 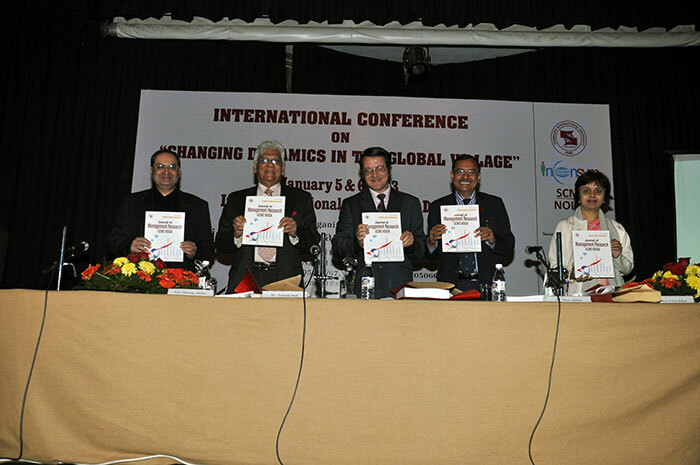 Ambassador Mohammed Hacene Echarif (MNI), Algerian Ambassador to India, enlightened the gathering about the demography of the Algerian population which was followed by the launch of the first volume of Journal of Management Research and the Conference Proceedings by the eminent guests. Dr. Justin Paul, Professor, University of Washington, Foster School of Business, USA, delivered a special address on Day 2, followed by an address by Dr. T.P. Singh, Dean, Faculty of Engineering, Symbiosis International University and Director, Symbiosis Institute of Technology. Dr. Rajani Gupte, Pro Vice Chancellor, Symbiosis International University delivered the Valedictory Address and distributed the prizes and certificates. More than 65 papers were presented relating to the broad areas of Marketing, Economics, Finance, Human Resource Management and Technology, providing a robust platform for productive interaction and knowledge sharing between the world of Business and Academics. 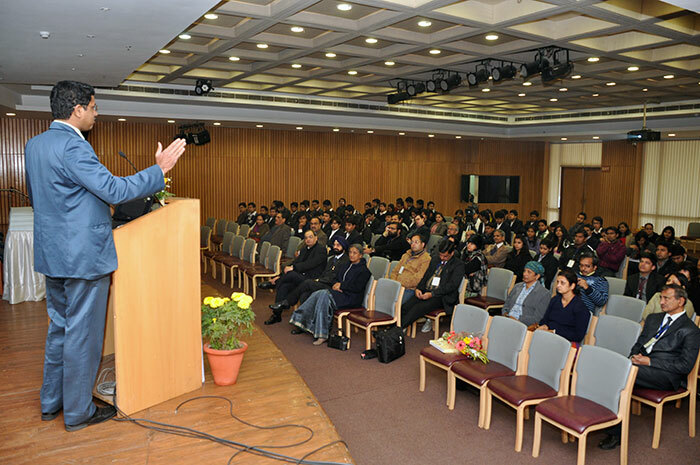 Symbiosis Centre for Management Studies NOIDA Research Group (SRG) is a forum set up with the objective of promoting Management Research in day-to-day environment in business, industry and other organisations. 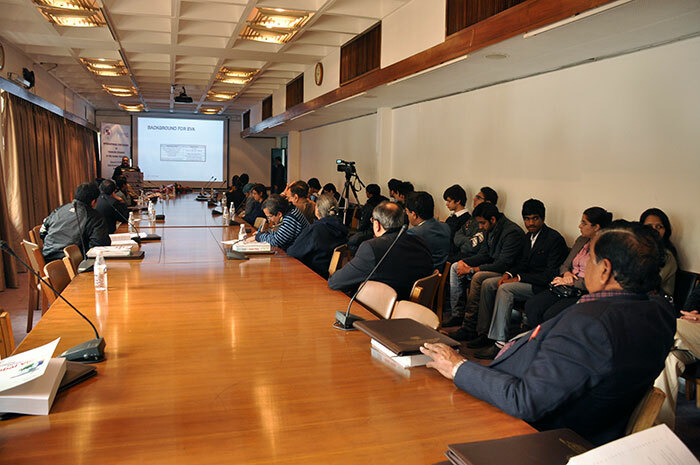 The group is involved in activities such as conferences, lecture meetings, seminars and discussions, short courses / workshops and counseling to student members. The SRG publishes a bi-annual journal called Journal of Management Research - Symbiosis Centre for Management Studies NOIDA, which is committed to publishing scholarly empirical and theoretical research articles that have a high impact on the management field as a whole. Membership of SRG has various categories: Senior Member, Life Member, Student Member and Institutional Member. All the participants of various conferences organized by Symbiosis Centre for Management Studies-NOIDA are eligible for the membership of the SRG. Regular news on the activities of the SRG call for papers and events. Opportunities to join all events and initiatives organised by the SRG, with additional benefits, such as reduced fees. A chance to shape the future of the SRG. The SRG is democratic and open to all disciplines and any member can become involved and contribute. Opportunity to use the membership-workspace to initiate discussions, create discussion forums, to add topics and suggest new areas that you would like supported. Symbiosis Centre for Management Studies NOIDA publishes a bi-annual journal called Journal of Management Research - Symbiosis Centre for Management Studies NOIDA (ISSN 2319 – 7552), which is committed to publishing scholarly empirical and theoretical research articles that have a high impact on the management field as a whole.